I have had this knife in the works for quite some time now. Months, actually. Most of my projects have been on hold for a long time, while we have been constructing our new workshop (which is why you haven't seen much from me lately). I haven't wanted to build anything before its finished, as our current shop is a wreck and I don't have a place to make videos. Whenever we finally do get finished, you can look forward to some really awesome projects. This is a knife I forged out of a railroad spike, which I found lying on the ground in a location which I don't particularly want to disclose to the general public. Note: There are thousands of old rusted RR spikes which are completely useless, discarded by everyone and will never be used again lying beside RR tracks. Note #2: It also happens to be illegal to pick up any of the thousands of old rusted RR spikes which are completely useless, discarded by everyone and will never be used again lying beside the aforementioned RR tracks. 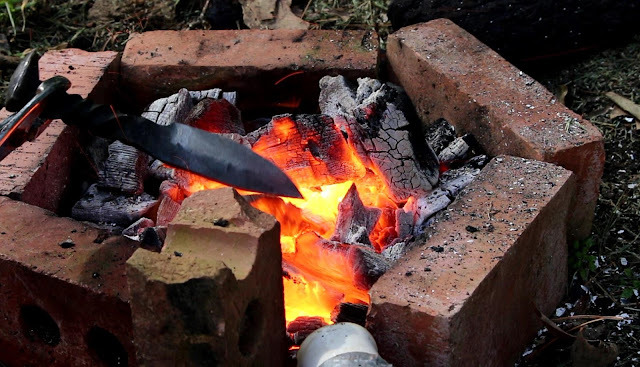 I'll not go into detail about how I forged this knife (that's a good subject for another day), no, today I am going to be documenting the process of heat treating a knife. 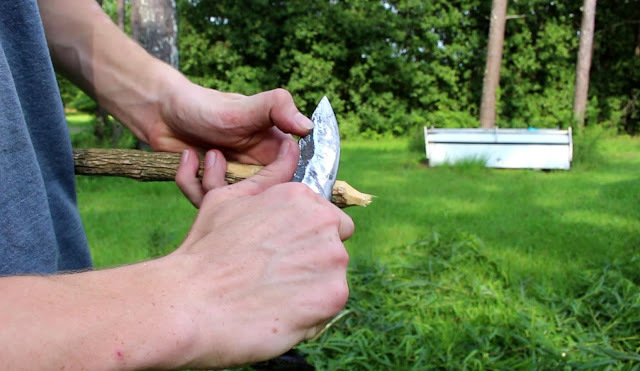 More specifically, the process of HT-ing a knife in the simplest and easiest way possible. Without any further ado, let's get started. 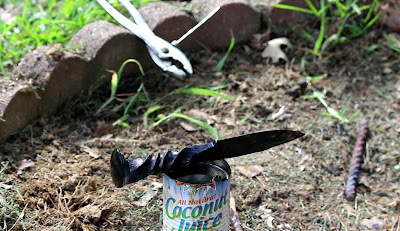 Side note: The fact that I am using a RR spike knife to demonstrate the HT doesn't change the process in any way, it's just the knife I had on hand that needed finished up. The process is the same for any simple high carbon steel. 1. Charcoal. Here, I am using 'natural' hardwood lump charcoal. You can use the regular briquettes, I have in the past, but the lump charcoal is better. 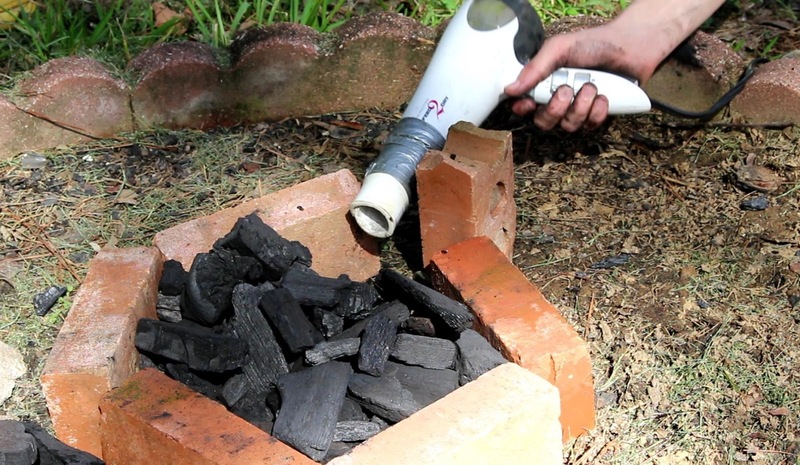 It heats up faster, gets hotter, and is easier to use. 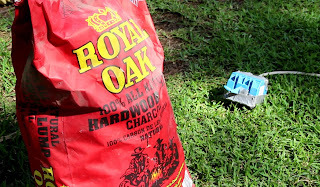 If you are feeling especially redneck, I'll mention that you can actually use regular wood (anything will get hot enough with a lot of air on it), but it is more difficult and burns way faster, so you'll need a lot more of it. 2. Air source. Here I'm using a semi-broken blow dryer Mom had thrown away. The heating element is busted, but as we just want the air it doesn't matter. 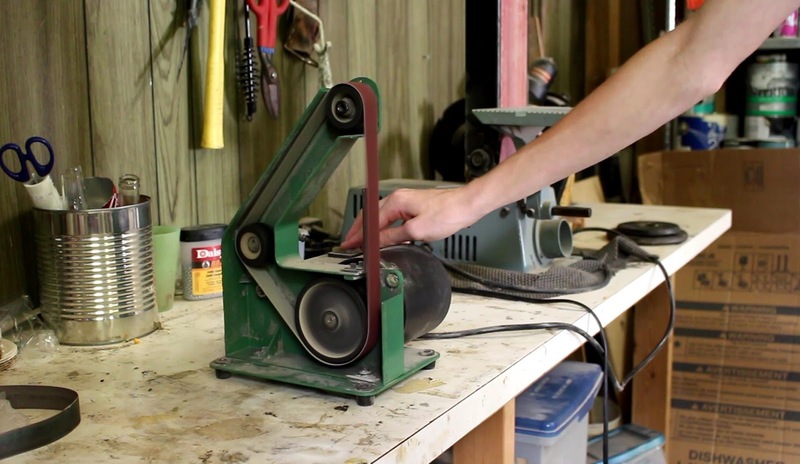 You can also use a heat gun, leaf blower, or even a shop-vac (with the intake switched so it pushes instead of pulls air). 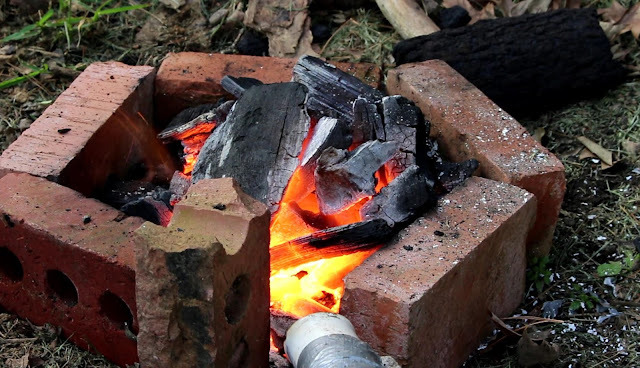 All you want is to put feed large amounts of oxygen into the fire. Be creative. 3. Quenching Oil. 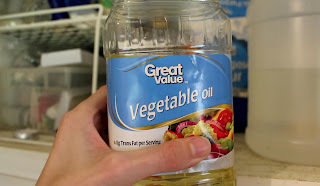 There are a few options for the oil you use, I am using plain vegetable oil, because it's cheap and I have it on hand. 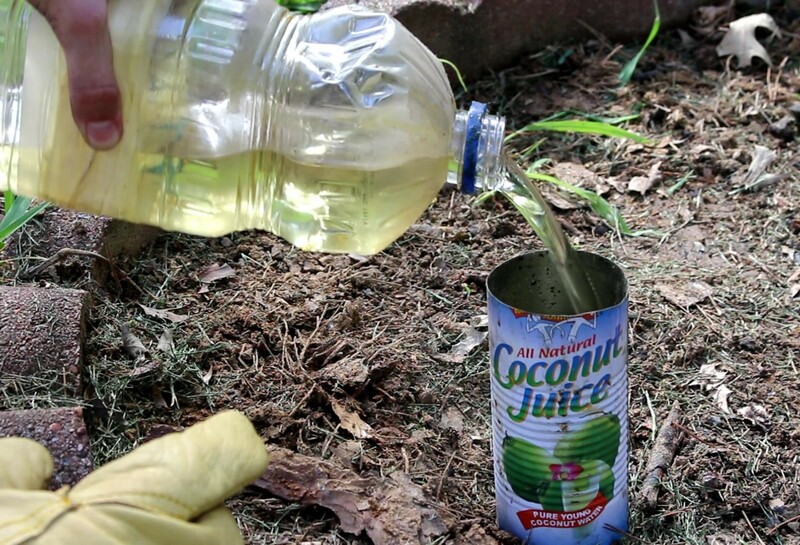 Realistically, just about any kind of oil would work for this. Vegetable oil, olive oil, peanut oil, motor oil, used motor oil, etc. It will all work. 4. A magnet, for testing the temperature of the steel. 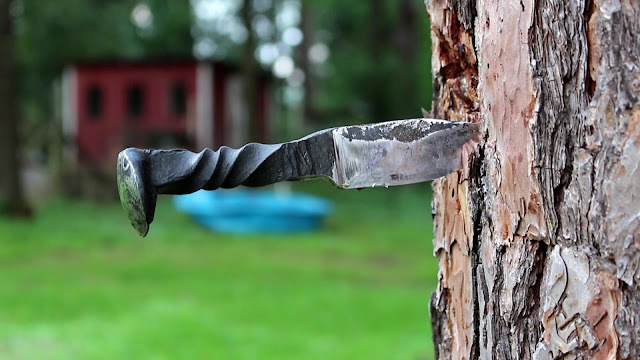 You will need a way to touch the magnet to the steel without burning yourself. I am using a broken telescoping-magnet-thingie. 5. Something-with-which-to-take-the-knife-in-and-out-of-the-fire-with-without-losing-any-fingers. 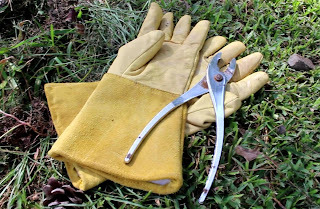 I am using some long handled pliers and welding gloves. Trust me, you will be wanting them. A charcoal forge like this will get upwards of 2000 degrees fahrenheit. 6. 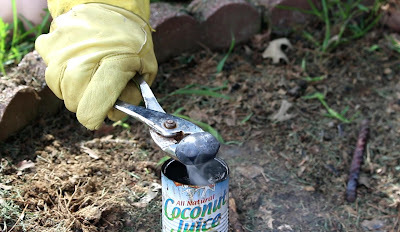 A heat resistant container (to hold the oil for quenching). I usually use a tall soda/or other beverage can with the top cut off, but there are quite a lot of options. Just make sure it's able to take the heat. 7. Forge. 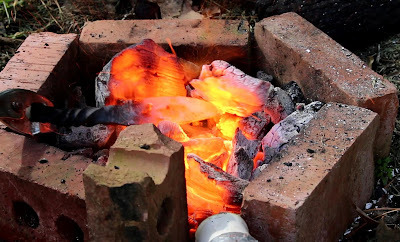 Quite obviously, you are also going to need a forge of sorts. For this bare bones heat treat, there is no need to over-complicate things. 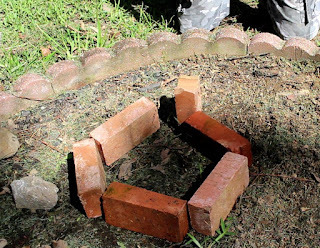 As you can see, my forge for this project is nothing more than several bricks arranged in a circle, with an opening on one side for my air source. No need to get fancy. Alright, I think that's about all. Now on to the actual thing. ​The first step would be to start up your forge. 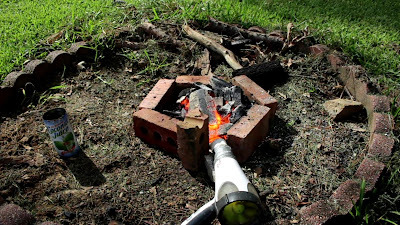 I loaded up my brick box (well, really more of a circle) with a sizable mountain of lump charcoal, got my hair dryer in place, and lit her up. 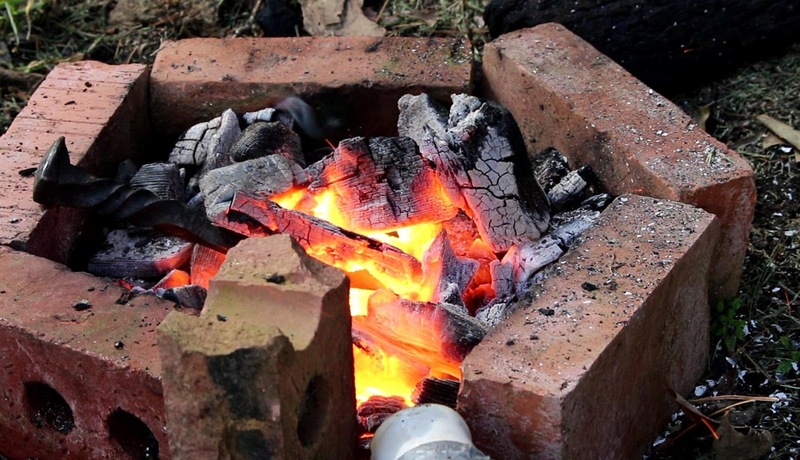 You will need to give it a few minutes to heat up, I generally wait till most of the charcoal has turned to white/gray color. At that point the forge is upwards of 2500 degrees Fahrenheit, and almost too bright to look at directly. Yes, you actually can melt steel in a crude forge like this. 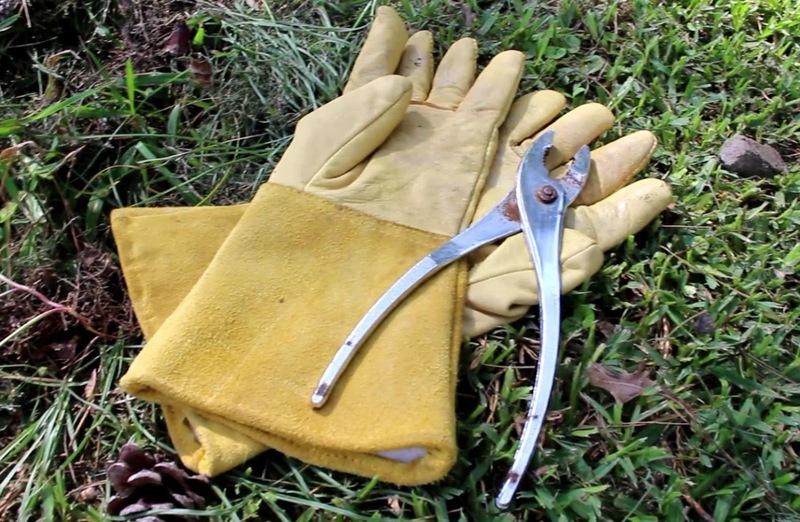 You will not be able to get your hands anywhere near it, which is why I recommend welding gloves. 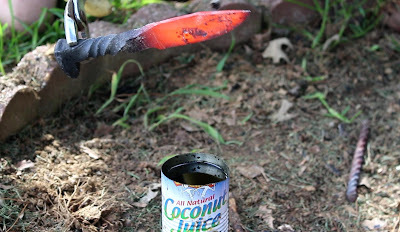 While you are waiting for the forge to reach temperature, its a good time to get your quench ready. 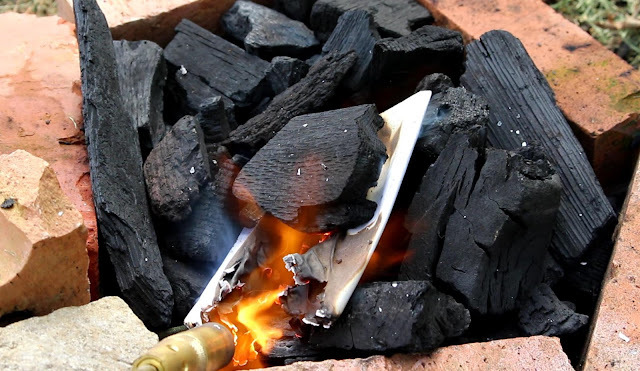 Get the oil in your heat resistant container, and pre-heat it to about 130 degrees (Fahrenheit). You can heat it up on your stove if you like, the way I did it was by heating a piece of rebar in the forge, and then dunking that into my quench. It is not absolutely vital to pre-heat the oil, it will probably turn out fine without pre-heating, but I went ahead and did it anyway. I believe its more important if the weather is cooler, and the outside temperature is much lower. 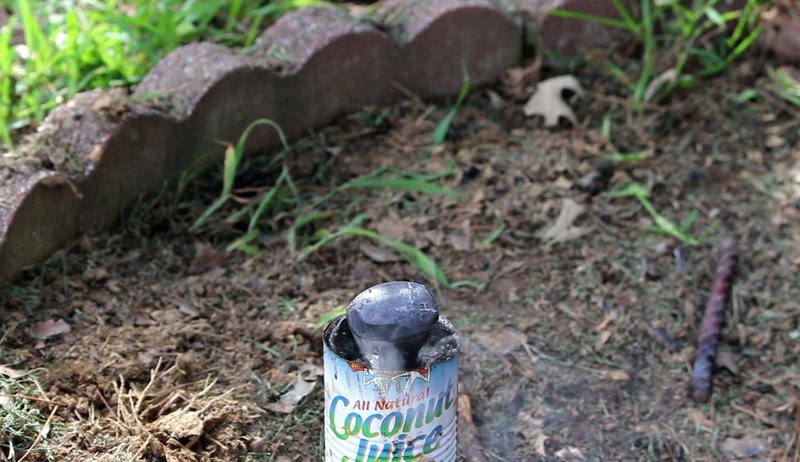 If you are quenching in Mississippi summer sunshine (like me), you can probably do without. 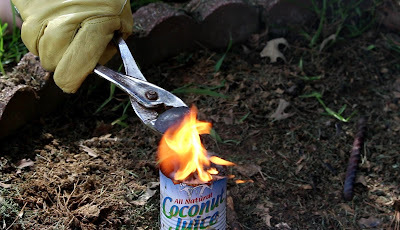 After you have heated up your forge, go ahead and stick the knife in. Now comes the most difficult part, where a nice beautiful temperature regulated HT oven would come in handy; heating up the steel evenly. 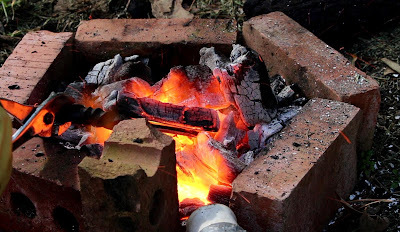 And yes, it is very difficult with a charcoal forge like this, especial if you are making a knife with a large blade. 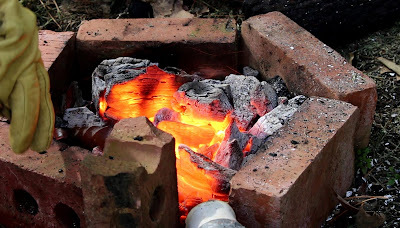 It is definitely doable, though, just keep working at it, and try to find the best spot in your forge for even heating. 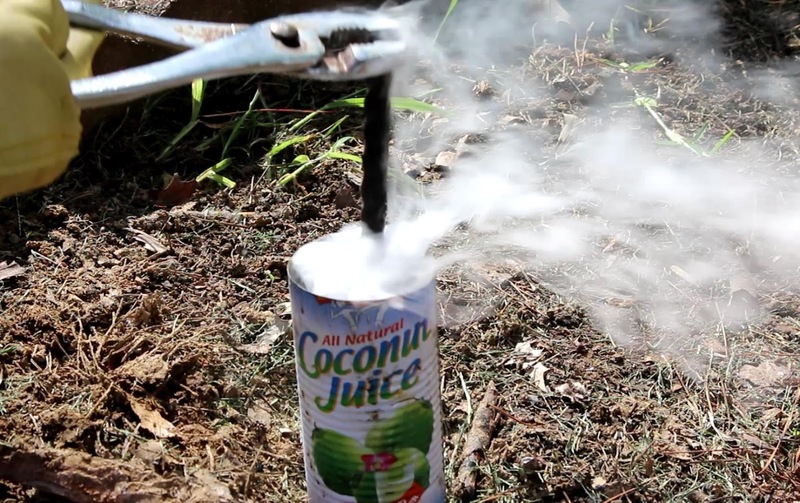 You will also need to be careful of overheating the steel. A little bit over and you'll be fine, just let it cool back down a bit. 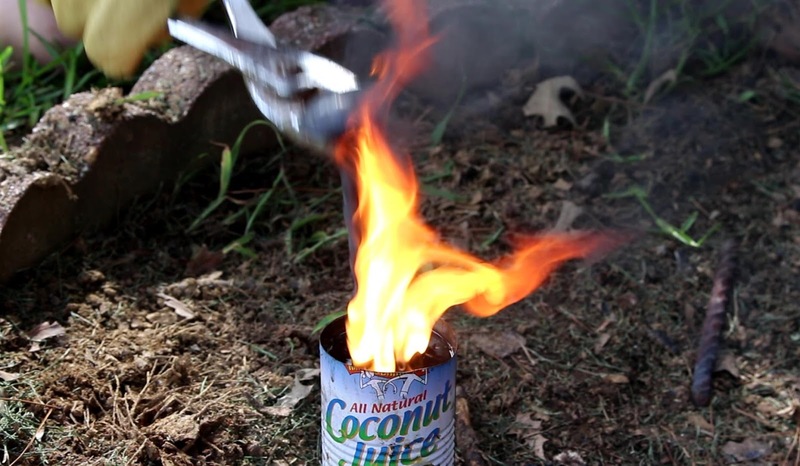 However you don't want to let it too far above critical temperature, as you will risk cooking the carbon out of the steel, as well as just melting the steel dead away. 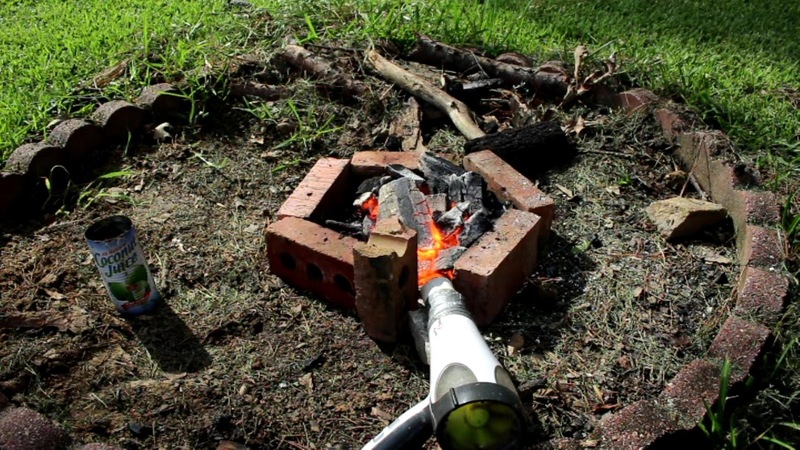 Don't underestimate the power of this forge. It will melt your blade if you leave it in for too long. As you are heating it up, watch the color of the steel. After you have heat treated a few knives, you will be able to tell roughly what temperature the steel is based on the color. 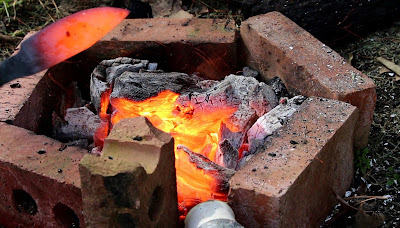 Until then, you'll just have to trust me; 1500 degrees (what you are aiming for), is a cherry red color which comes just after the metal first starts to glow. This is where the magnet comes in. It is an interesting property of steel that it ceases to draw a magnet when it hits 1345 degrees Fahrenheit. 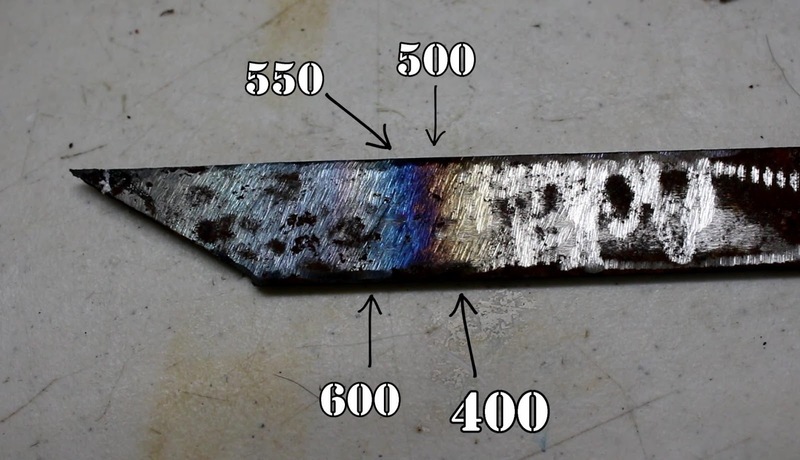 The critical temperature of high carbon steel is around 1475. As the steel heats up, touch it to the magnet every few seconds. When it stops sticking to the magnet, you know you are close. A few seconds longer, or until the steel has shifted color a notch brighter, and you know you have hit critical temperature (approximately 1475). 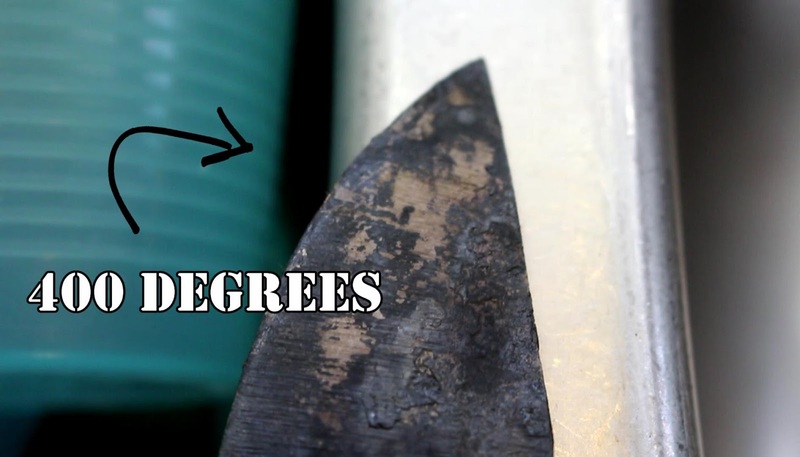 Another method you could use to determine the temperature of the steel is to put salt on the blade. Table salt has a melting point of 1474 degrees, so when the salt melts, you know you have hit critical temperature. But as I said, getting the steel to critical temp isn't very difficult. 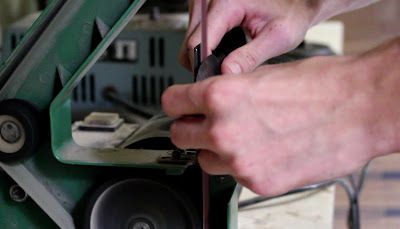 Getting the whole blade evenly heated to critical temperature is the challenge. 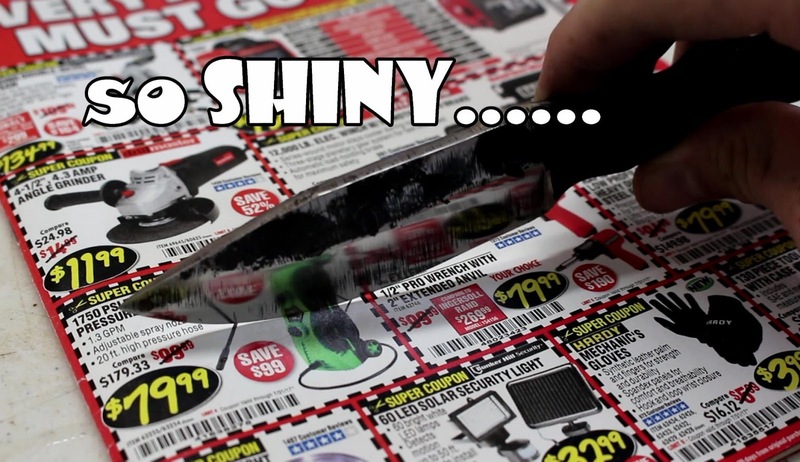 After all, you don't want half the blade hardened and have the tip bend when you look at it wrong. When you are satisfied you have got the blade to critical temperature, you need to move fast. Before you lose too much heat. 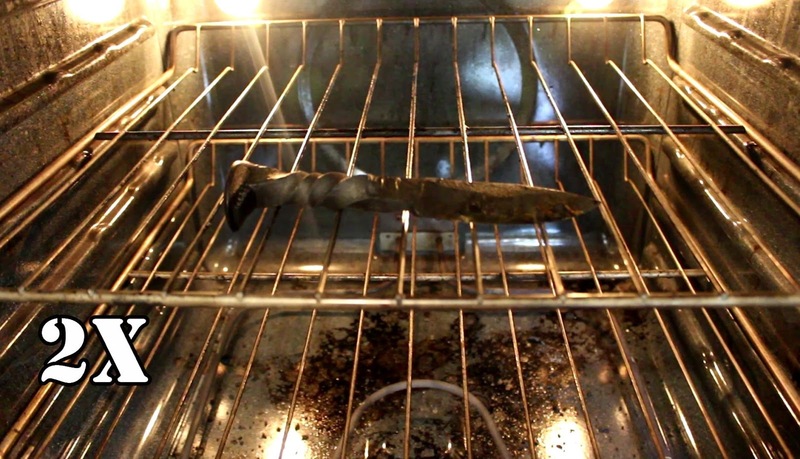 Quickly move the knife out and plunge it into the oil. I generally agitate it back and forth inside the oil, to break up any air bubbles that may have caught in there and make sure that blade is cooling evenly. 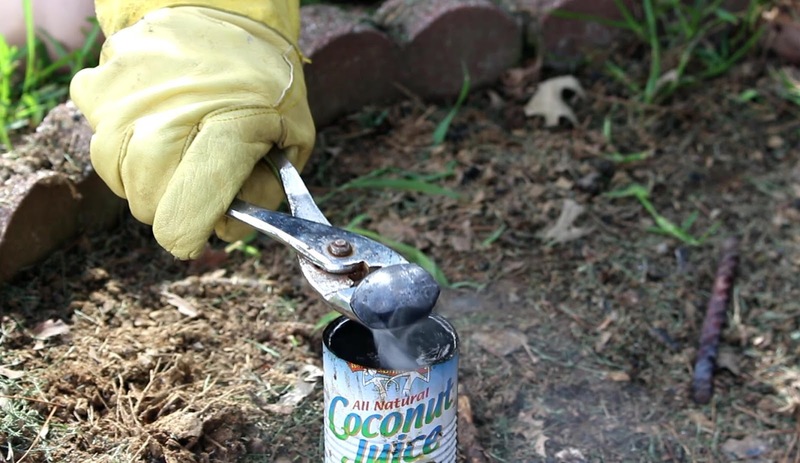 In the video you can see me pulling the knife out of the oil and putting it back in several times. That is known as an interrupted quench. ........Don't do that. I was just sort of messing around, and wanted to see how it would turn out if I quenched it that way. 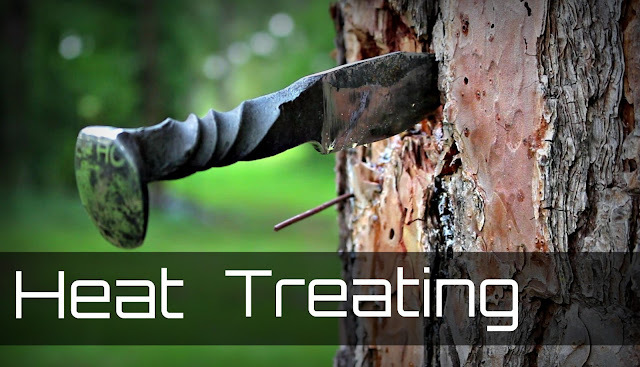 For certain quenchants and certain steels, an interrupted quench can be beneficial, but for this heat treat it isn't necessary and if anything, could make your steel softer. 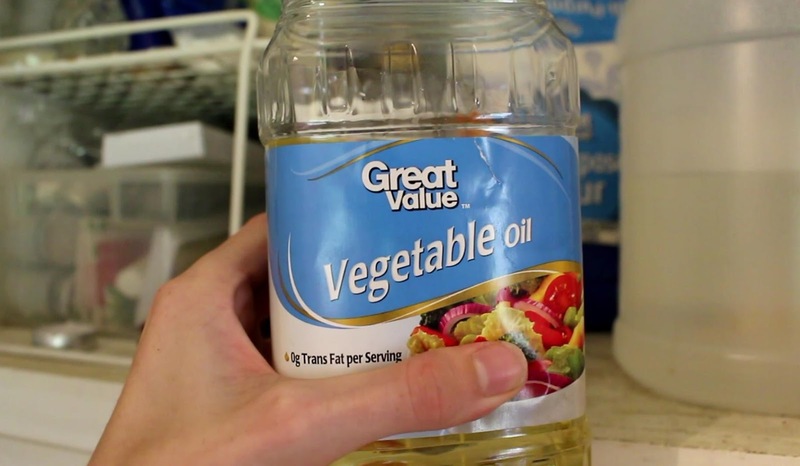 Just plunge the knife into the oil, move it around a bit, and leave it in there until it is cool. After quenching, the steel is extremely hard. So hard that it is about as brittle as glass. If you were to drop it or subject it to any amount of force at this point, it would be liable to shatter or crack. In other words, it is way too hard to be a knife. The next step is to heat the blade up again, this time to 400 degrees. This relieves the stress built up in the steel, and softens it down a bit, and you end up with the perfect hardness for a knife blade. Its called tempering. 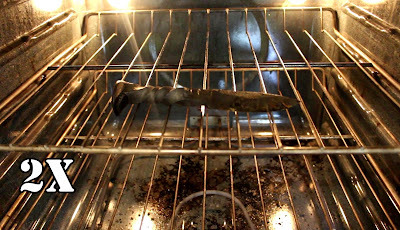 There are a number of methods you could use to accomplish this, but the easiest (and best for beginners) is to put it in the oven @ 400 degrees for two cycles of one hour each, letting the knife cool between cycles; or until the steel has turned a wheat/golden/brown color. Yes, steel changes color as it is heated. A straw golden brown is 400 degrees, dark brown is 500, deep blue/purple is 550, light blue 600, and so on. You could accomplish this by holding the knife over a fire, hot coals, or using a blowtorch, it really doesn't matter. When the steel hits that golden straw color, you know you nailed it. At this point, the heat treat is completed and the knife is fully hardened. All that it lacks is the finishing up. ........Which is my least favorite part. 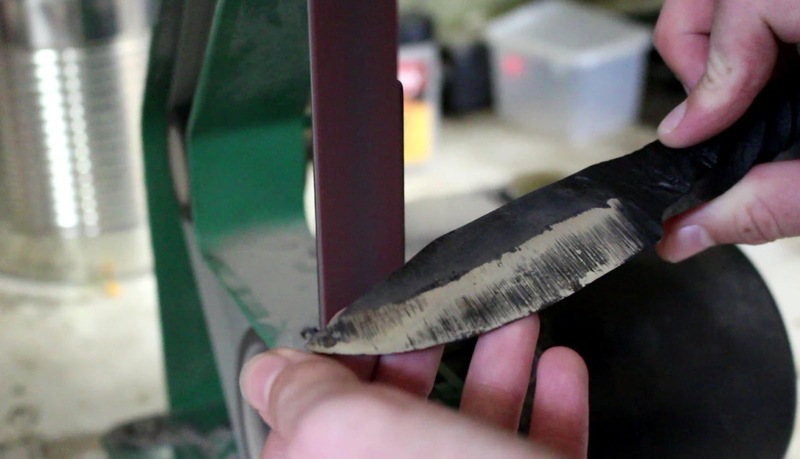 Quenching has a nasty habit of producing this material known as scale all over the blade. In advanced technical terms, it is commonly known as CRUD. Now you have to sand all of it off and make the knife look good again, as well as finishing up the grind and everything else left to do depending on the knife you are making. Normally this is where I add handle scales and all that other fancy stuff. Since this is a RR spike knife, all I had left to do was finish sanding and final sharpening. We now have a finished, fully functional knife. 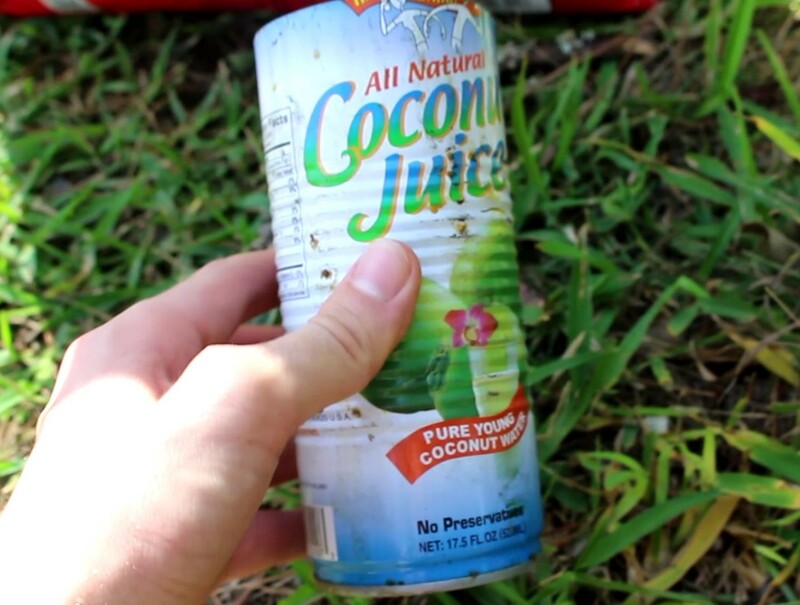 Building a Hairspray gun from TRASH! !